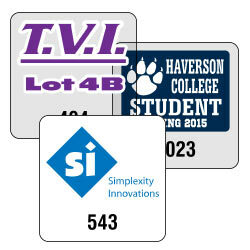 Do you need an easy way and cost effective way to show parking validation? 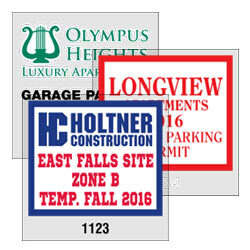 Then custom printed square parking permits are your solution. Square parking permits, also called muncipal stickers, are meant to be placed on the inside of windows. 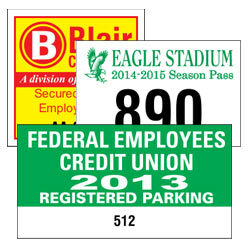 Custom printed parking permits can be easy to spot with a logo or name on them, and also promote your organization. 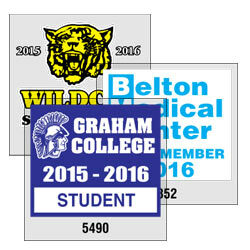 Our square parking permits come in 2 styles, clear polyester or static stick vinyl. Both styles are supplied on face adhering material. 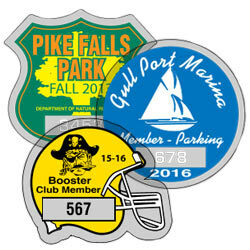 Clear polyester permits use face adhesive, and static stick permits use static on the face. These are great for schools, apartment complexes, parking decks, and government facilities that provide secured parking. Numbering: 7/32" consecutive numbering is available. 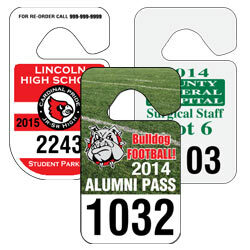 Be sure to add the price of numbering to the price of printing. Please specify beginning and ending number when ordering.